When you want to export your data from Jama, there are a few options for which type of report you can use–Office Templates, BIRT, or Velocity. Although serving the same purpose, they do it in very different ways. We have separated out these two different types of reporting to provide a better understanding of how you retrieve information from Jama. There are a few terms to be familiar with before understanding how Jama goes about creating reports. A template is a set outline of how you would like your data displayed in your report. Templates are uploaded to Jama to specify a certain type of export. Exporting is the act of extracting data from Jama to a specified file type. This process uses the template to organize the data for the report. An export is the final product of exporting a template. This will be the exported file that holds the data the template specified. Office Templates can be found under the Export pull-down menu in either list view, reading view, single item view or the Test Run view. Office Templates are context sensitive meaning that you pre-select the items you want to report on. Usually, it is a set, a baseline, filter, etc. In the example of context-sensitive reporting below, this Round Trip Report has exported Item Type, Name, Status and Priority to be updated and imported later. This used exactly what is shown in the window, but that might not always be the case. Context sensitive is determined by a combination of what is being looked at and the content within the template. Reports can be exported from the Reports menu found next to the username. These exports are organization-based and can be run from anywhere in Project View. Context sensitive templates will all be found in the Office Templates menu. Any templates that are located in the Reports menu will not be context sensitive. The purpose behind context sensitive is to consider what is displayed while the export is being built. The code within the template will determine what to do with the context to populate the export. An example of context-sensitive is, like above with the round trip export, the exact columns that are showing in the list view will be reflected in the export. This won't always be the case. Sometimes the code depicted on the template will dictate the fields displayed and the context will be the items shown. Or, in the example of the All Items Detail report, this will list all items in the project regardless of what is showing. This is still context sensitive considering it is using the context of the whole project. Context sensitive templates can be constructed with either mail merge fields in Word or via the API with Velocity. When uploading a context-sensitive Velocity report in the root menu, the Context Sensitive checkbox must be selected. 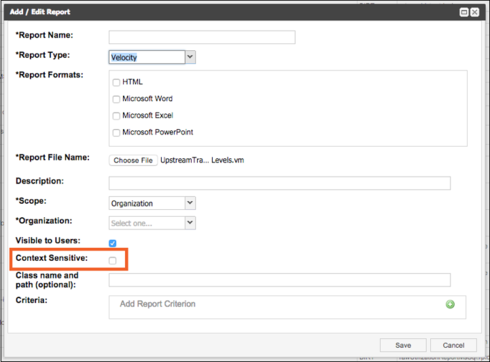 If Context Sensitive isn't checked it will be located in the Reports menu and will not run as expected. Along with the built-in Word Office Template exports, you can create your own Word templates using mail merge fields. This will allow you to specify the exact information you need within your Office Template. To download a guide on the mail merge fields used to capture data you can download the Word Template Reference Guide after selecting Upload a Template. These are built and populated in Microsoft Word. Custom Office templates can be uploaded two different ways. The first way, possible only to manage project permissions, is by selecting Export > Office Templates > Upload Office Template. 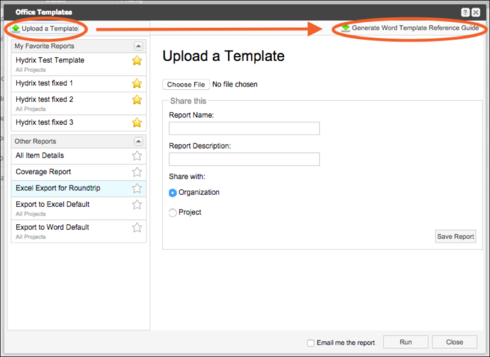 This option is accessed by selecting Upload a Template in the Office Templates menu as illustrated by the image above. The second way is by logging in as root user (for on-premises customers only) and selecting Reports > Add a Report and selecting MS Office Template or Velocity as the Report Type. Hosted customers will need to refer to this post on the community about custom reporting.